No, just green with batting. Quilters Dream Green that is. I completed “Twister” a Studio 180 Design pattern for a class I was teaching several months ago, but I just now found time to quilt it. 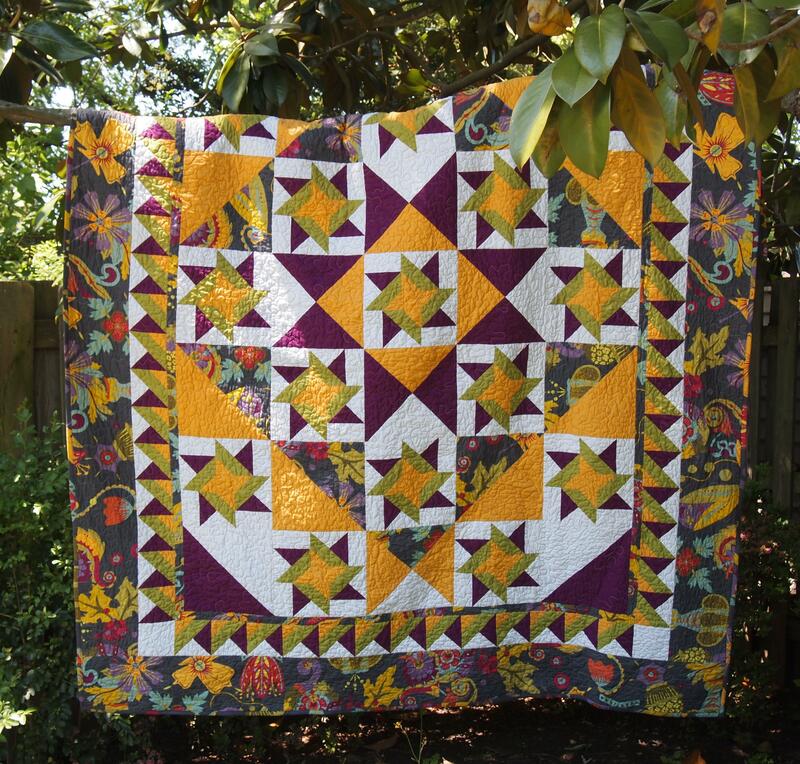 I love this pattern, it is a companion pattern for the Tucker Trimmer I. 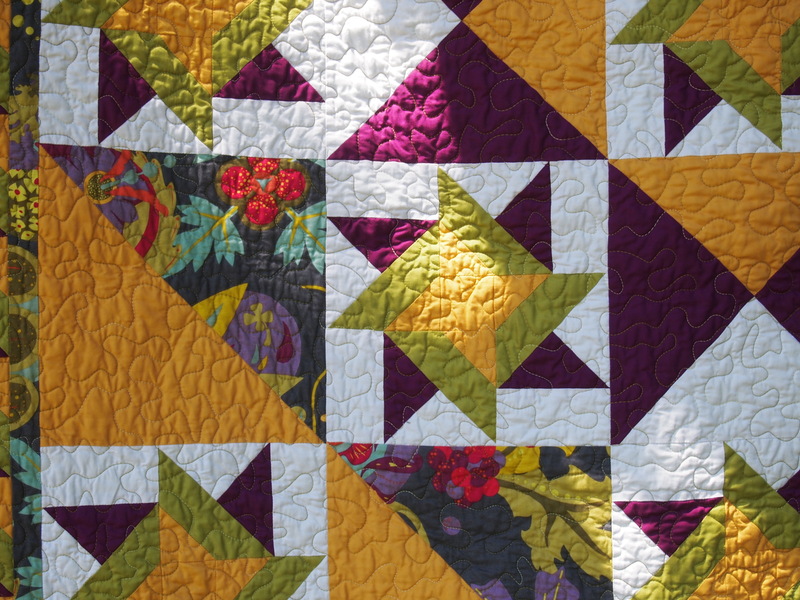 There is nothing like a pieced border to give your quilt eye catching appeal. I used a focus fabric by Alison Glass called Lucky Penney in the border. It was my jumping off point for the colors I chose. This was my opportunity to try Dream Green earth friendly batting, made from 100% recycled plastic bottles. Recycled plastic bottles are cut into chips, washed, melted and extruded into fine polyester fibers. Processed using the close-the-loop recycling chain, it is pro-environment in both its raw material source and its manufacturing process. Each pound of Dream Green Batting keeps 10 plastic bottles out of our landfills. Dream Green loaded easily and stitched beautifully. There is no scrim or resins, yet you can stitch up to 12″ apart. I machine washed it in warm water and dried it on a medium heat. I thought it behaved very much like cotton batting. There was very little shrinkage. I was pleased with Dream Green and will use it again. Twister is a great skill building pattern. 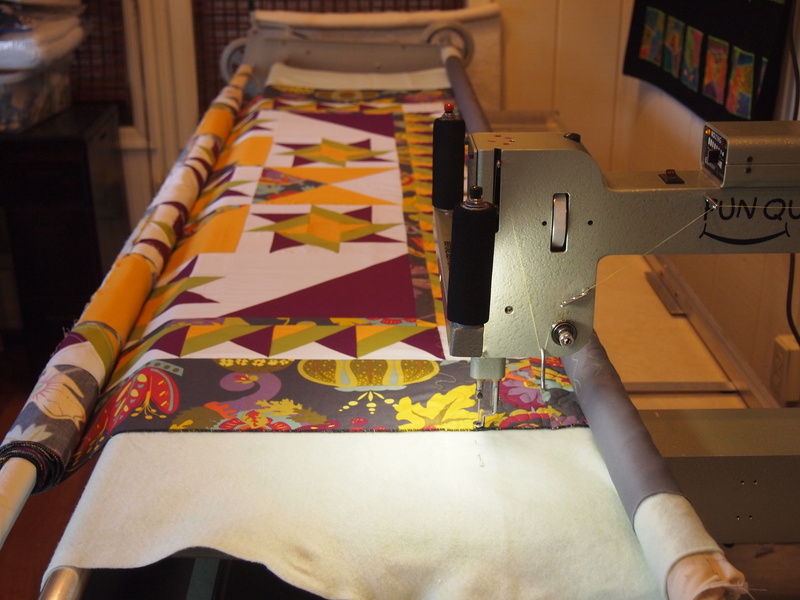 This entry was posted in Dream Green Batting, Twister and tagged Deb Tucker, Dream Green, Quilters Dream Batting, quilting, Quilts, Studio 180 Design, Tucker Trimmer 1, Twister on May 4, 2014 by ifthesethreadscouldtalk. Batting from bottles — how divine. Those colors are divine, too. I like the use of solids and just that one wonderful print. Thank you so much. Taking the picture outside really made the colors pop. Thank you so much. It is amazing, I posted a picture of the top before it was quilted. This picture after it was quilted looks so much more vibrant.